Those that know me know that I’m a dreamer. Head in the sky, full of lofty ideas – a true daydream believer. What’s been in my head lately has been this house. This 100 year old farmhouse for sale just outside of town on four and a half acres. A few months ago, on a whim, I decided to go to its open house and completely fell in love. I guess the whole romance begins on the long lavender lined drive up to the front, just that alone lets you know that you are in for something good. As soon as I opened the front door I could just sense that we belonged in that house. Maybe it was the old wide planked wood floor that creaked just so, or the original built ins or the huge country kitchen that demanded daily fried egg breakfasts. But I can’t get this place out of my head. If we lived in this old house we’d certainly breath a little deeper, speak with a little more thought and walk a bit slower. At least that’s how I see it in my head. The boys rooms would be upstairs. Up creaky steps to pitched roof rooms. With some new windows to open for a breeze and some old windows so they could spend boring rainy days looking out at the world through melted glass. The property around the house is flat and surrounded by large trees – perfect for a future apple orchard and vegetable garden. I walked out of the backdoor, off the back porch, past the lawn through a gate to the back of the property where a creek runs. Stepping over the hap-hazard stepping stones to the water, I brushed by some wild mustard and onions and it just overwhelmed me with the thought that this is what childhood should smell like. And what it should be made of. Swimming and exploring in that creek, smelling those wild smells and moving about your day with the secret thought that maybe ghost wonder around those old pitched roof rooms of theirs. So, you’re wondering, why haven’t we bought this dreamy place already? Well, four acres with a dreamy farmhouse in Sonoma doesn’t come cheap. Even in these hard economic times. 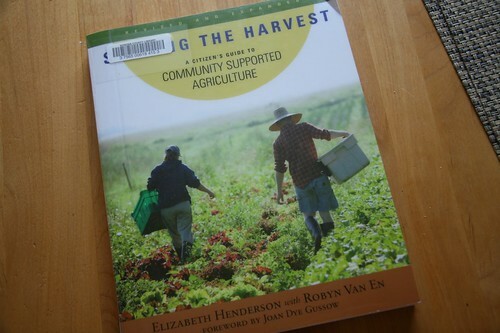 But, I think I have figured out a way to make it work, thanks to this book I’ve read for Green Bean’s Bookworm Challenge called Sharing the Harvest: A Citizens Guide to Community Supported Agriculture. We are going to start our own CSA. And you are all invited to join! Its going to be just wonderful. This book explains everything you need to know on how to start and operate a CSA and I think, in my dreamy mind, that it would be great fun. 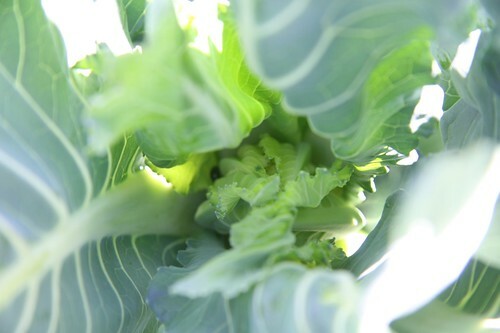 We’ll grow acres of fruits and vegetables to shower you with and since there’s already a chicken coop there, we’ll bring our chickens and provide eggs for you too. I’ll bake you all tarts and Scott will make you all jam. You can all come over on the weekends to help and we can have picnics in the orchard and bonefires during harvest parties. And after doing all the math, this will only cost you a cool $1000/month. Hmmm, what’s that? Oh, I guess that is a little pricey. And I suppose running a farm wouldn’t be all fun all the time. But a girl can dream, can’t she? It makes me feel good though, that even though we can’t afford this place just yet, that it exists. That in this world of shiney homedepot granite and mcmansion newness that there still are small, authentic houses on large pieces of land that are to be had. And someday we’ll own one, but maybe not quite yet. Happy Memorial Day! I write to you all achey, sunburned, sore, calloused and hands full of splinters. I’ve been digging this weekend. Digging post holes for a new fence to go behind my flower garden and in front of the veggies. Post hole digging is a lot of work! Especially in clay soil. But this fence is something I’ve been talking about for years now and I decided this weekend that I was finally going to do something about it. For now it looks like a big mess, but soon I will post pictures of all its hoped for glory. Last night after hours of digging I picked up a gardening book and read a little blurb that said that 45 minutes of gardening will burn 200-300 calories. I suppose they included that to make you feel better about all that work you just did, but I quickly exclaimed, “That’s it?” That doesn’t even cover the brownie I ate as a mid-dig snack. I think post hole digging really must burn much more than that, don’t you agree? 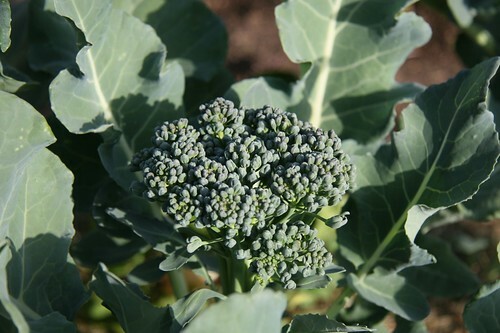 I plan to post soon with more garden updates and a book review for the Bookworm Challenge, but for now I’ll share a picture of broccoli which we picked a bunch of this weekend. I’ll be back once I let my body rest a bit. I hope you all are having a great long weekend! Just thought I’d give an update of Tomato Alley. The original post I did has been my most viewed post, hopefully people will try this growing method and have great success. I think the beauty in it is that by putting the drainage pipes into the ground, you are able to get more water and oxygen down to the roots which makes for a happier plant. Scott mulched this past weekend with straw. 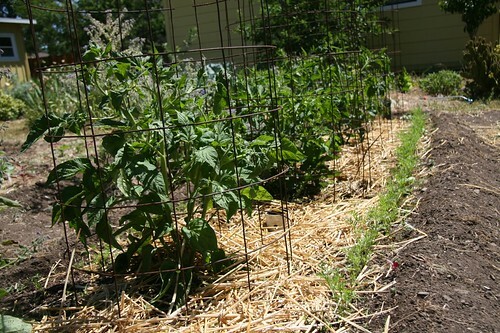 By using a thick layer of mulch and our pipes we only have to water them once a week. Which, when we are facing certain water restrictions this summer, is a welcome thought. All plants are looking happy and healthy and this latest little heat wave did them well. 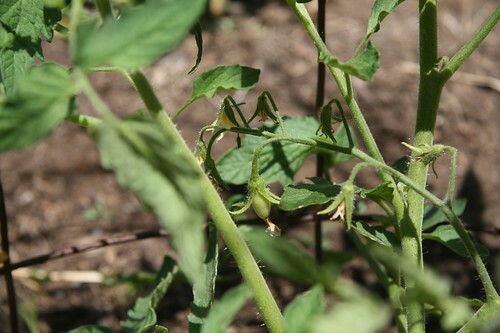 We even spotted our first San Marzano. We love San Marzanos. Because of their meatyness they make for great sauce. It seems I turned around the zucchini grew from seedling to adolescents. Isn’t that the way it is with zucchinis? So the interesting thing about these guys is that Scott started that one in back at the end of March on our potting table. Then a month later when it was ready to plant out, he did so then put in two more seeds into the ground next to it, which are the other two plants you see. They are the same size! Sometimes its just not worth it to start sewing seeds early, in our yard at least. A couple of days ago one of my favorite blogs to read, Compostings, wrote about Mark Bittman’s talk at TED and that made me think back to when I went to the Taste3 conference a few years ago. Taste3 is based on TED but is geared to Food, Wine and Art. Three of my favorite topics. The conference was put together by former employeer which is how I was able to go, otherwise I wouldn’t have been able to afford it. I left so inspired, from listening to Dan Barber to watching Pilobolus to sitting down to lunch with Katrina Markoff, my creative fires were burning. Although it just took place, you can see past videos right here on your computer. If you have a moment and want to be inspired, click over to here. oh, cauliflower, you’re so dreamy! Whoever thought that cauliflower could look so dreamy? We spotted the start of a head this morning. Hey, is that bug in there I see? 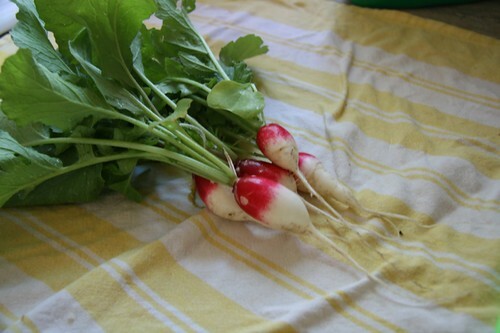 Here are our french breakfast radishes, bug bites and all. 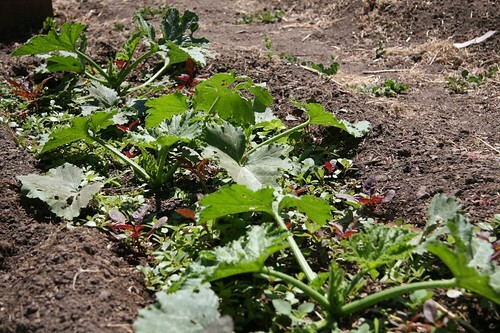 Our friend, Doug, told us this weekend that his favorite organic bug control is to mix soy sauce and canola oil and put out a dish of it in the garden. The bugs are attracted to the soy sauce, but once they get the oil on their legs they can’t move. He said he can’t find anything else to compete with it. This might be just the fix for our radish bed. For all the locals, isn’t this cooler weather nice? That heat wave was too much! Even though it did scorch some plants, it made our tomatoes and peppers very happy. But this weekends cooler weather allowed us to do some spring harvesting. 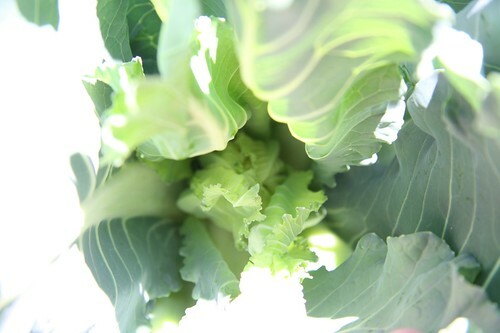 We pulled up lettuce plant after lettuce plant….anyone want to come over for a salad? Dinner’s at 6:30 tonight! We also harvested the rest of the hardneck garlic (the same garlic that I used a few weeks ago for Orangette’s green garlic & spinach soup). Scott pulled it out of the ground and just let it lay in the sun for a day or two, then yesterday cut off the leaves and put it in a box outside to dry. 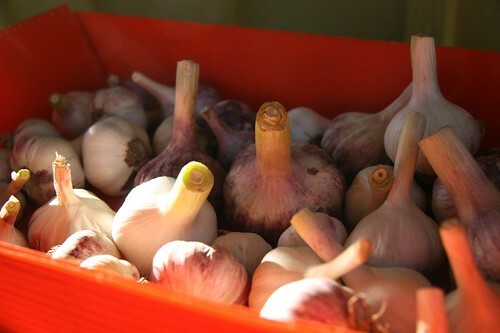 The hardneck made this garlic too difficult to braid, so we are going for box storage for these guys. We planted the single cloves back in January and we are now blessed with 47 large bulbs. Let’s see how long it takes us to use them up. 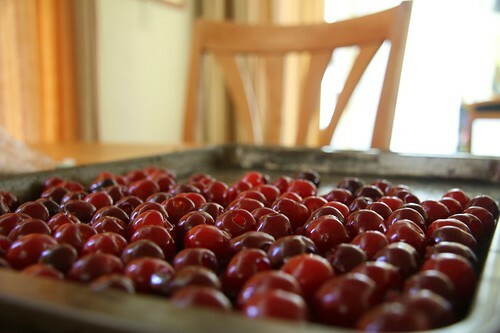 I also spent some time up in a ladder this weekend harvesting cherries. Looks like the birds were generous enough to leave us plenty for eating and some for freezing. We didn’t freeze any last year, only canned the jam, but since we have plenty of jam left, I thought I’d go for freezing this year. Being high up in that fifty year old tree, with limbs covered in lichen, the evening sun pouring through the leaves, I felt like a kid reaching for those shiny red jems. One for the basket, two for me. 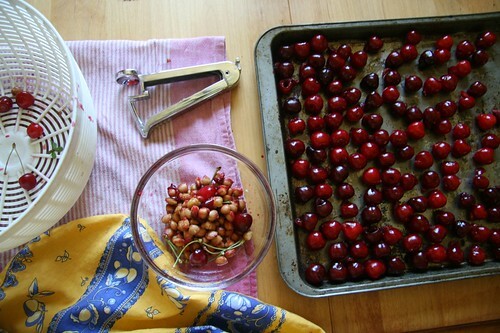 I could harvest cherries all day.